Above is a word cloud from my unedited first draft of last year's NaNoWriMo novel. 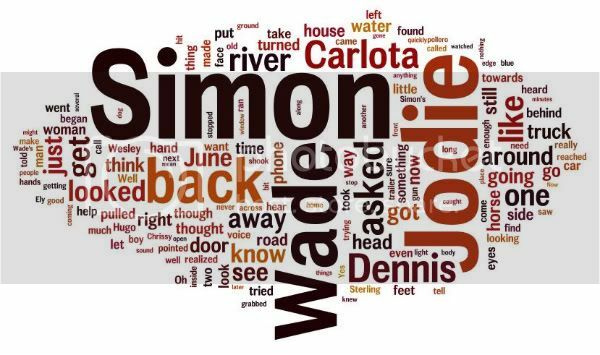 The text size of a word reflects how often it's used in the novel (common words like "I" or "and" are excluded), so it makes sense that the biggest words are then names of my main characters. But look at the biggest word that isn't a name - that big orange one just under "Simon". Yes, it's the winner for "Cat's Most Unnecessarily Overused and Redundant Word" Award, "back"! These are all words that I throw in without thinking in my rough drafts. Once I'm at the editing stage, I like to do a search for them in the document and take a look at each one to make sure each use is truly necessary. As I write more, I hope that I'll begin to catch myself writing "back" or "just" so I don't have to work so hard at editing them out! Have you made a word cloud for your stories? Did they help you notice words you might overuse? What are some of your own redundant words?